We arrived in Bangkok on a late Thursday night. 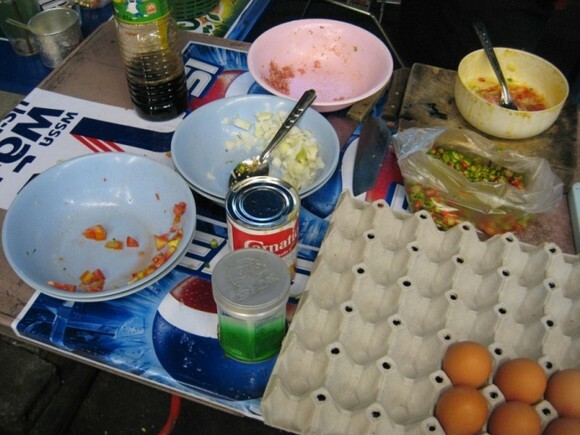 After we settled into our tree house/hostel, we walked around the Sukhumvit area looking for midnight snacks. 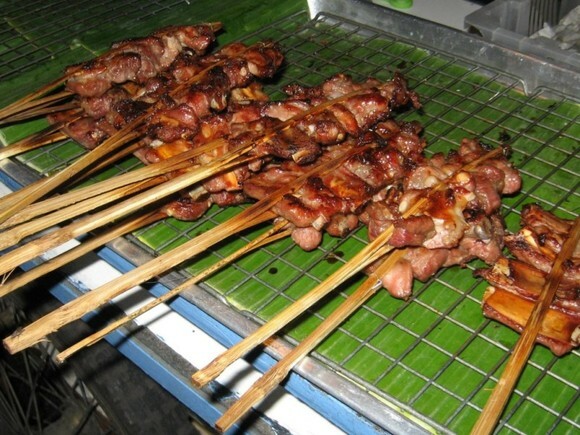 The Astronomer and Lush shared short-ribs on a stick for 20 Thai baht (1 U.S. dollar = 31.6 Thai baht). It seems like I’m practically the only person on Earth who doesn’t get excited about meats on a stick. It was clear after this evening that they rank alongside ladyboys as the pride of Bangkok. If there’s one thing that moves me, it’s carbohydrates. Even though it was completely unoriginal to order Pad Thai, I couldn’t help myself. The noodles were made to order by the gentleman above. This is the first of many plates of Pad Thai to come (30 baht). Peanuts, chilies and fish sauce were served tableside for each diner to season their noodles to taste. The texture of the noodles were good, but the sauce was short on the tamarind and thus lacked the tangy oomph that I love so much about Pad Thai. After our snacks, we headed back to the hostel to crash. On our first full day in Bangkok, we headed to the mega-malls along Sukhumvit road. The shopping complexes in Bangkok put King of Prussia (Philadelphia, PA) and South Coast Plaza (Orange County, CA) to shame. I procured two sweet dresses. If this were a fashion blog, I’d totally share. Since it’s not, you’ll just have to settle for what I ate. On our walk to the mall, The Astronomer picked up a pineapple pastry (12 baht). The crust was buttery and flaky and the pineapple preserves were sweetened nicely. We stumbled upon an outdoor market selling all sorts of food a few meters away from the pastry vendor. We picked up a box of “Chinese Pudding” (40 baht) to share. 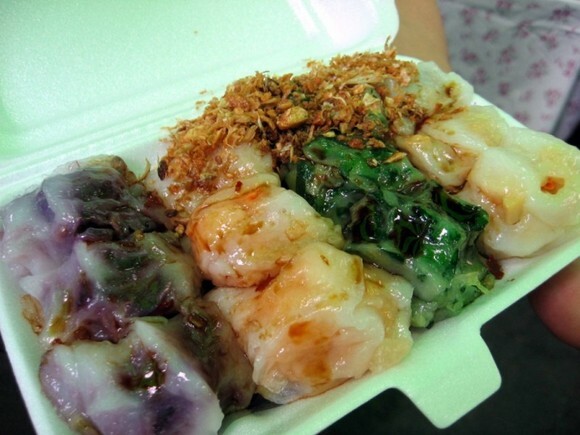 Our variety pack contained dumplings filled with jam bean and shrimp, bamboo shoots and shrimp, Chinese chives, and taro. The one filled with Chinese chives was bitter-city. The sauce was lacking a certain something, maybe MSG? 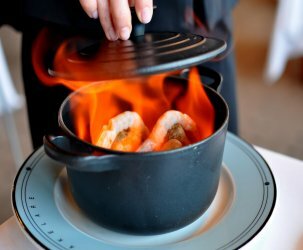 We were happy to try a new dish, but weren’t crazy about this one. A+ for presentation. 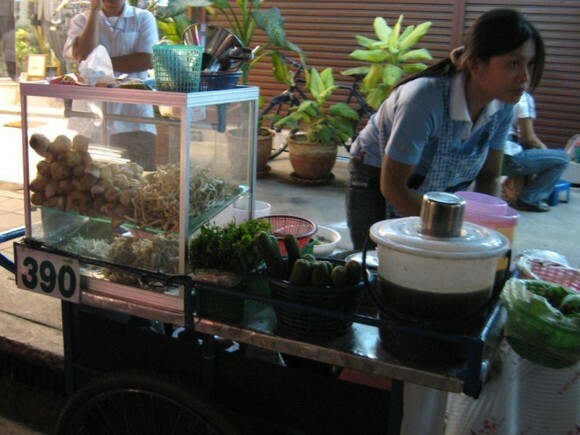 As we circled the market, I spied a lady serving up sticky rice! If you haven’t figured it out by now, I am a sucker for sticky rice. We sat on a stoop just outside the market to dig into our box (25 baht). 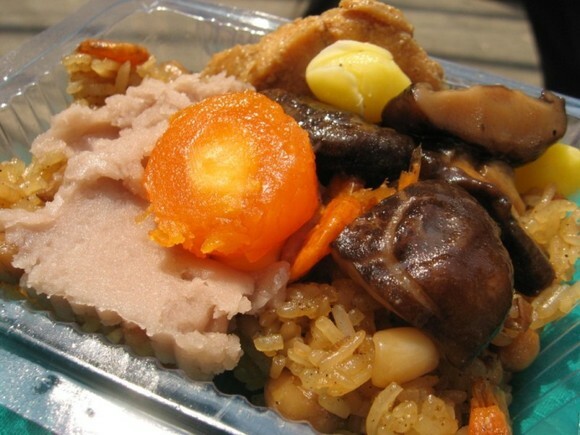 The rice was topped with shitake mushrooms, ginko nuts, a salted egg yolk, sweet taro paste, chicken and dried shrimp. Talk about everything and the kitchen sink! 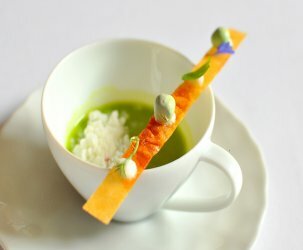 The combination of sweet and savory ingredients struck me as peculiar at first, but turned out to be decent. Next, I picked up the most disappointing grilled banana ever (5 baht). It was starchy, dry and didn’t contain a trace of sweetness. I took one bite and gave the rest to a homeless woman. I should have picked up the grilled corn rounds instead. After some shopping in Central World, we headed to their extensive food court to refuel. 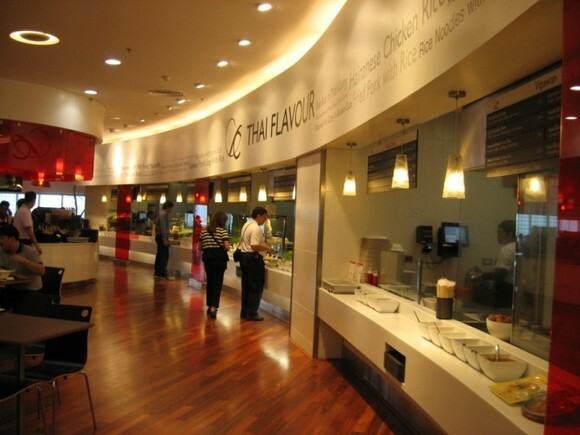 I learned from Austin at Real Thai that the food courts in Bangkok are a great way to familiarize oneself with the local fare because English translations are truly very helpful. I was much too full to partake, but luckily The Astronomer had some space left. He ordered a green curry and red curry with rice (40 baht). 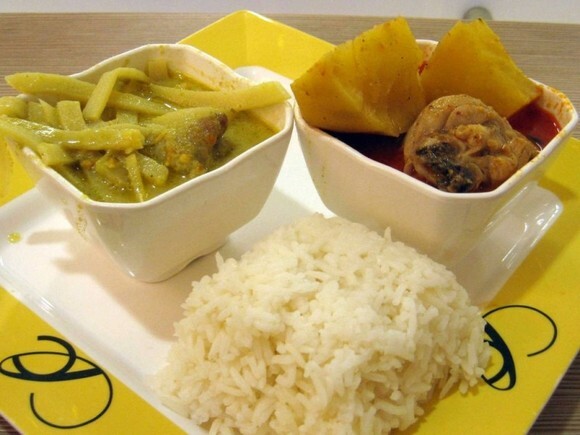 The green curry (L) contained plenty of bamboo shoots that I liked, but was way too spicy for me. Mouth. Fire. The red one was milder and reminiscent of Indian curry. 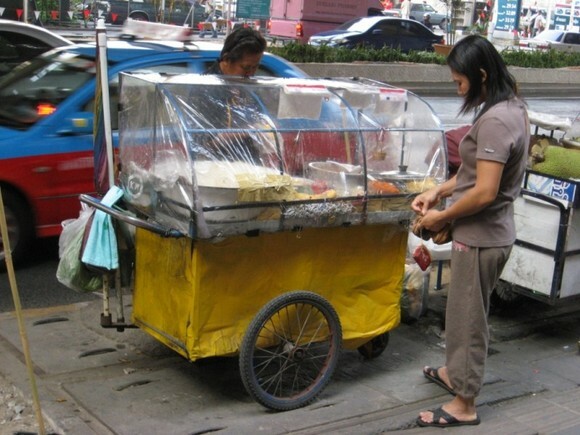 On our walk home from the mall, I spotted one of my favorite Thai treats—Mango with Sticky Rice! Eee! 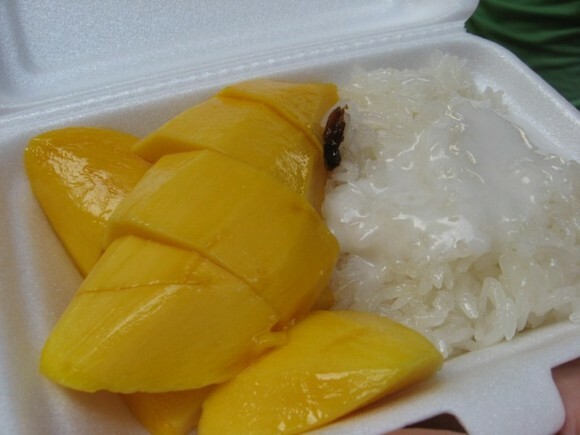 I’m not sure if its a supply and demand issue, but mangoes with sticky rice in Bangkok are pricey. At 40 baht, the price of this dessert is roughly equivalent to a street entree. 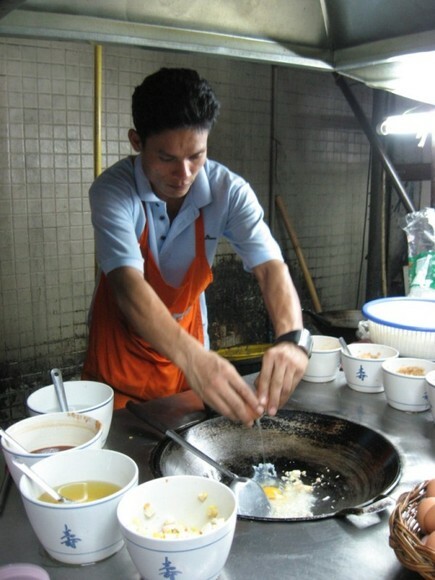 The mangoes I had in Bangkok were unbelievably good—sweet, soft and luxurious. The perfectly ripened fruit really makes the whole dessert shine. Our final snack of the afternoon were some Thai Tacos (2 baht). The exterior was a thin and crispy pancake that tasted like a fortune cookie. The insides consisted of marshmallow cream and shredded vegetable matter. Pumpkin? Squash? Googling “Thai Tacos” did not shed any light on the matter. After shopping and gorging all day long, The Astronomer and I went on a run at a park in town. Circling the man-made lake was a real treat after months of choking on motorbike exhaust in Saigon. Afterwards, we pounded the pavement once more to eat eat eat. Lush and I picked up a bowl of lemongrass mushroom soup (40 baht) from the vendor above. 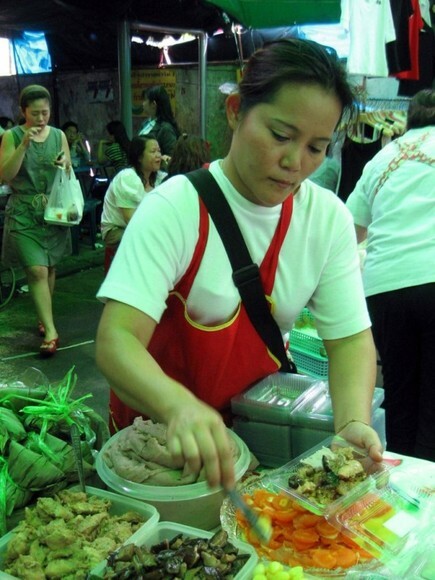 She, along with the corn and chicken dealer (below), were stationed on Soi 11. Brimming with a variety of fungi and vegetables, the aromatic hot soup was very pleasant. 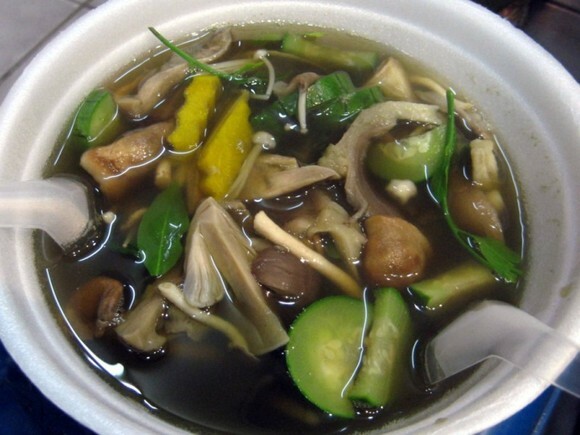 My favorite were the enoki mushrooms, straw mushrooms and zucchini slices. 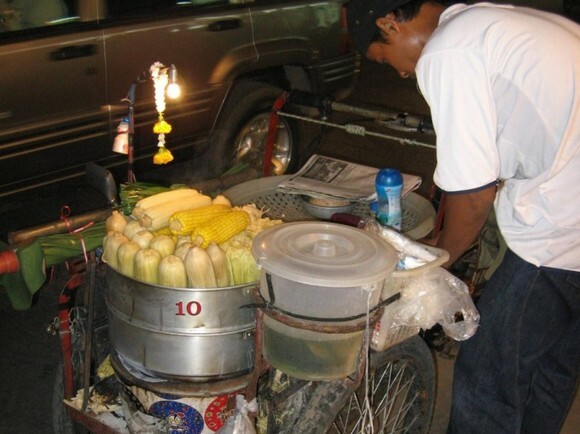 Meanwhile, The Astronomer purchased some boiled corn on a cob (10 baht). It tasted just as we suspected—corn-like. 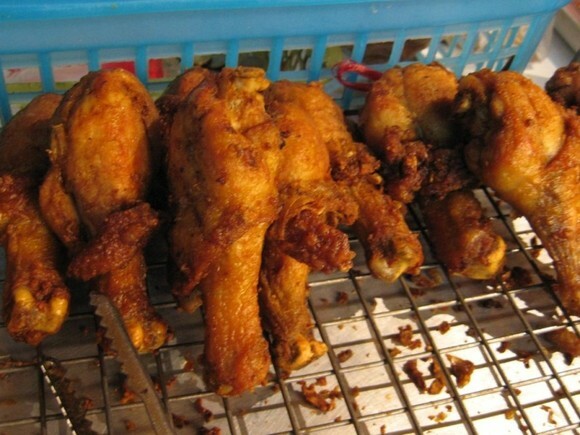 He also picked up a nice looking piece of fried chicken (12 baht). He said it was better than the Colonel’s original recipe. Now, that’s a compliment. South East Asia adores KFC. 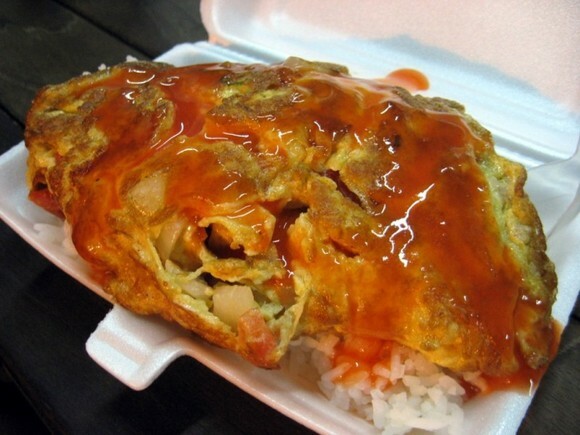 The Thai omelet (20 baht) was full of fluffy-eggy glory. This dish was very satisfying, especially with its huge serving of rice. Lush thought the vendor went a little too crazy with the chili sauce on top. Yep, it sure looks that way. 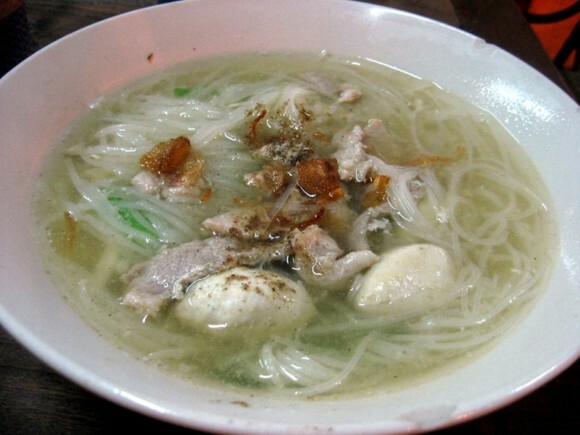 The Astronomer had a bowl of pork noodle soup with fish balls (25 baht) for his third course of the evening. He proclaimed the noodle soup good, but not nearly as tasty as the Vietnamese noodle soups he has enjoyed these past couple of months. 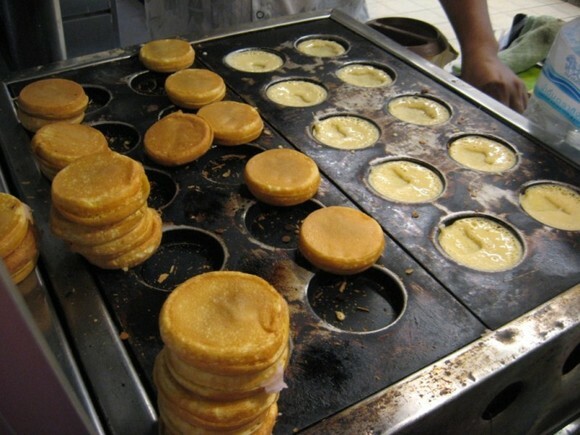 Our final bite of the day were Imagawa-yaki, also known as Japanese waffles. We purchased two waffles to share, one made with custard and the other with taro (4 baht). The batter tasted like a cross between Jiffy cornbread and frozen pancakes. The custard-filled one was our favorite. Wow, Cathy, how much can you eat in one day? I salut you. I was in Bangkok last year, the food was AMAZING. 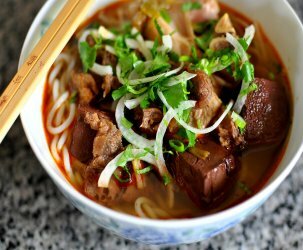 In Catuchak, they had very nice noodle soup! what a great post, this has been one of my most favorite reads of yours ever since i found your site when pieman mentioned it in a post a year or two ago! Awesome post..! i missed Bangkok so much. Sari – I couldn’t have eaten like a champ without my two travel-mates. So, I must salute them. I love papaya salad too and will post on the one I enjoyed in the near future. Chatuchak was a delicious madhouse. Vu- If you dug this post, you’ll surely appreciate the next installments. More eating in Bangkok in the coming days. Jon – genius. I wasn’t a fan of the panchi either. Too sweet and not much else going on. Popeye’s would make a killing in these here parts! Fo sho. Those little Thai Tacos are called panchi, I believe. It’s like a taro and corn cake with marshmallow in it or something. There was this Thai place in Montreal that served them…I was never a huge fan, but they’re not bad. If only SE Asians could know Popeye’s…so much better! Bern – Meat + stick = meat on a stick. Meat stick = Slim Jim. Stick meat = Dirrty. The ‘Thail Taco’s you mentioned containes carrot and shredded coconut. The marshmello stuff is whipped ricefour and coconut milk. I enjoyed them a lot too! 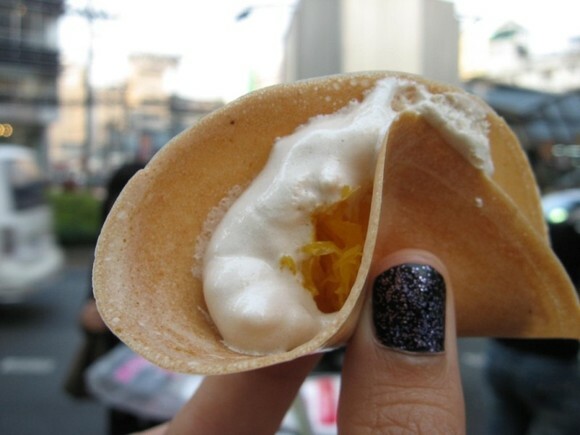 the taco shaped things are made with flours, and filled with egg white and sugar base usually. the orange stuff, if in shreds and sweet is egg yolk that’s been cooked in syrup. if it’s in bits and sort of salty – it’s a shrimp filling. those are the two most popular fillings. 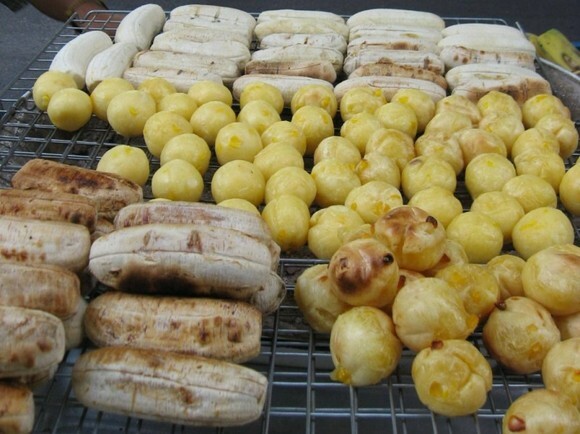 yeah Khanom Buang, they’re selling them at almost USD0.30 per piece the last time I went, in July of this year. even in MBK there’s a stall! when it’s hot, it melts in one’s mouth, those sweet, and creamy coconut fillings. … blissful. 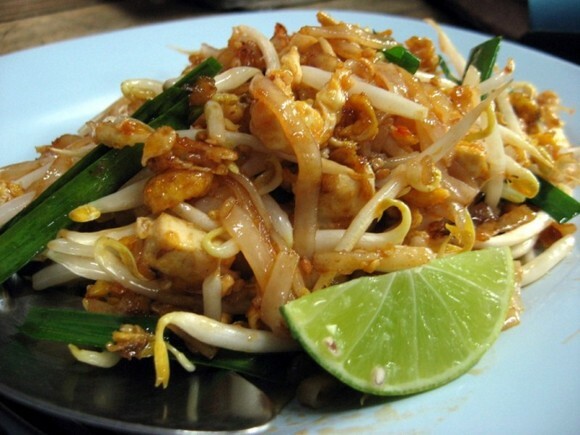 The “Thai Taco’s” mentioned above is called Kanom Buang or Kanom Buang Yuan. 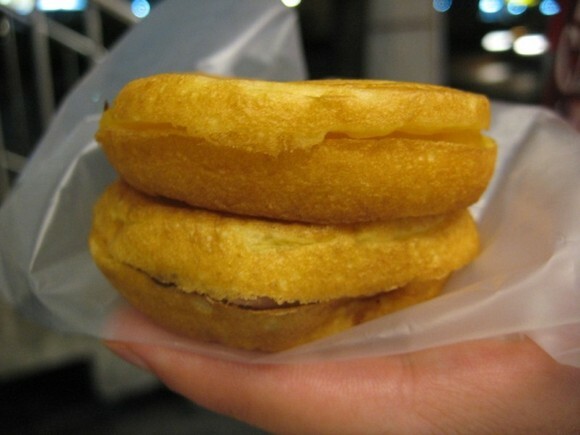 Yes, the crispy batter may taste similar to a fortune cookie; however, some may add a hint of instant coffee which would give it a different flavor. The marshmallow cream is actually coconut cream which has been beaten or whipped to a light consistency. The “vegetable” shred referenced is an egg…egg yolk combined with flour, then poured into a fine opening is dropped into a boiling syrup. This is commonly referred to as foi thong (golden string/strand. Nice blog, btw. You’re photos are lovely. Great post! FYI, thr yellow “vegetable matter’ shredded on your “Thai taco” crepe is actually dried shredded egg yolk!!! Yummy!!! 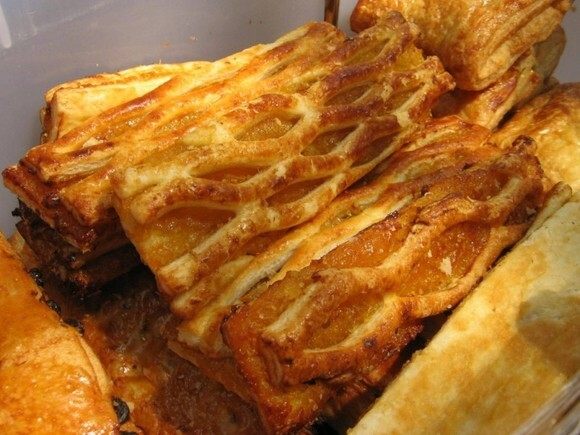 We tried the one with spicy sausage and raisins too… delish! ?